Researchers at Sandia National Laboratories' Z machine, the most powerful deliverer of bursts of electrical energy in the world, have helped untangle a long-standing mystery of astrophysics: why iron is found spattered throughout Earth's mantle, the roughly 2,000-mile thick region between Earth's core and its crust. At first blush, it seemed more reasonable that iron arriving from collisions between Earth and planetesimals — ranging from several meters to hundreds of kilometers in diameter — during Earth's late formative stages should have powered bullet-like directly to Earth's core, where so much iron already exists. A second, correlative mystery is why the moon proportionately has much less iron in its mantle than does Earth. Since the moon would have undergone the same extraterrestrial bombardment as its larger neighbor, what could explain the relative absence of that element in the moon's own mantle? To answer these questions, scientists led by Professor Stein Jacobsen at Harvard University and Professor Sarah Stewart at the University of California at Davis (UC Davis) wondered whether the accepted theoretical value of the vaporization point of iron under high pressures was correct. If vaporization occurred at lower pressures than assumed, a solid piece of iron after impact might disperse into an iron vapor that would blanket the forming Earth instead of punching through it. A resultant iron-rich rain would create the pockets of the element currently found in the mantle. As for the moon, the same dissolution of iron into vapor could occur, but the satellite's weaker gravity would be unable to capture the bulk of the free-floating iron atoms, explaining the dearth of iron deposits on Earth's nearest neighbor. Looking for experimental rather than theoretical values, researchers turned to Sandia's Z machine and its Fundamental Science Program, coordinated by Sandia manager Thomas Mattsson. 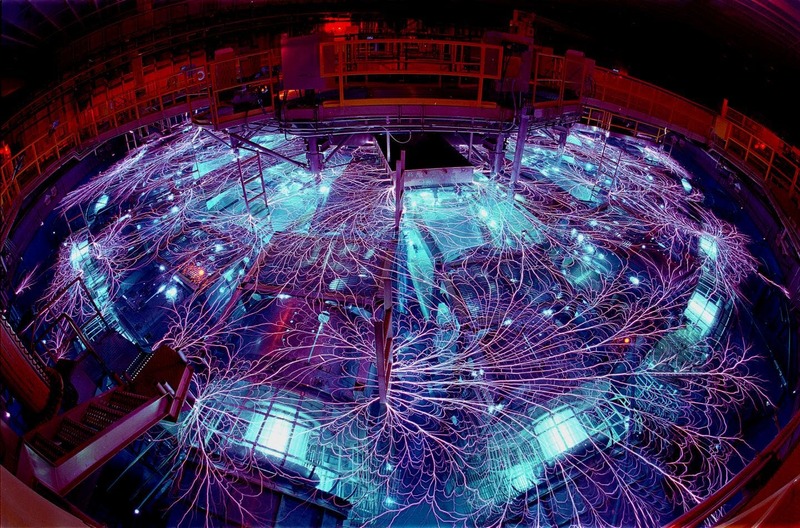 This led to a collaboration among Sandia, Harvard University, UC Davis, and Lawrence Livermore National Laboratory (LLNL) to determine an experimental value for the vaporization threshold of iron that would replace the theoretical value used for decades. Rick Kraus at LLNL (formerly at Harvard) and Sandia researchers Ray Lemke and Seth Root used Z to accelerate metals to extreme speeds using high magnetic fields. The researchers created a target that consisted of an iron plate 5 millimeters square and 200 microns thick, against which they launched aluminum flyer plates travelling up to 25 kilometers per second. At this impact pressure, the powerful shock waves created in the iron cause it to compress, heat up and — in the zero pressure resulting from waves reflecting from the iron's far surface — vaporize. The result, published March 2 in Nature Geosciences under the title "Impact vaporization of planetesimal cores in the late stages of planet formation," shows the shock pressure experimentally required to vaporize iron is approximately 507 gigapascals (GPa), undercutting by more than 40 percent the previous theoretical estimate of 887 GPa. Astrophysicists say that this lower pressure is readily achieved during the end stages of planetary growth through accretion. Principal investigator Kraus said, "Because planetary scientists always thought it was difficult to vaporize iron, they never thought of vaporization as an important process during the formation of the Earth and its core. But with our experiments, we showed that it's very easy to impact-vaporize iron." He continued, "This changes the way we think of planet formation, in that instead of core formation occurring by iron sinking down to the growing Earth's core in large blobs (technically called diapirs), that iron was vaporized, spread out in a plume over the surface of the Earth and rained out as small droplets. The small iron droplets mixed easily with the mantle, which changes our interpretation of the geochemical data we use to date the timing of Earth's core formation."